Dec. 29, 2015 9:00 a.m.
You might want to keep an eye on the sky for the next couple of nights. A solar flare that erupted in Earth’s direction Monday is expected to bring intense aurora borealis for the final nights of 2015, lighting the night in some areas that don’t usually witness the northern lights. The eruption of a sunspot cluster caused some radio blackouts in the southern hemisphere and sent a magnitude 1.9 coronal mass ejection racing towards us. “Space weather forecasters predict a direct hit with Earth’s magnetic field on or around New Year’s Eve, potentially sparking some natural fireworks in the upper atmosphere just in time for 2016,” according to discovery.com. “It means we have a chance of seeing aurora in areas that aren’t used to seeing it,” said Dr. Robyn Fiori, a research scientist for Natural Resources Canada’s Canadian Space Weather Forecast Centre. The solar eruption was timed perfectly with the sun’s rotation to point in Earth’s direction. She said most of the activity will likely happen Wednesday night. It’s not yet assured that that an aurora extravaganza will be visible across all of B.C., but it looks hopeful. 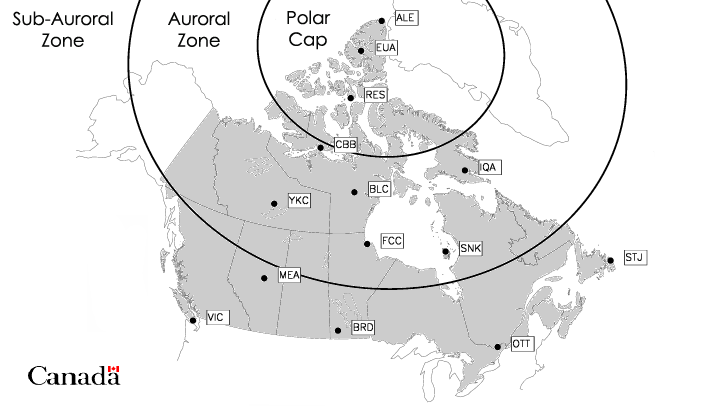 Fiori said the auroral oval around the magnetic north pole where aurora are most often visible normally only covers the northeastern corner of B.C. The NOAA’s Space Weather Prediction Centre says aurora may be visible at 50 degrees latitude and possibly as far south as Oregon. The U.S. agency has issued a “strong” geomagnetic storm watch for Dec. 30 and Dec. 31, creating potential for a natural light show on New Year’s Eve as revelers ring in 2016. NOAA forecasters say the sunspot cluster that unleashed Monday’s flare is unstable and could explode again, releasing further flares.